Commencing this week, CTSA Press Officer Colin Bowman will be featuring a staunch CTFC Supporter every week in our new “Fan Focus” slot. If you’d like to be featured, please contact Colin at a home or away game or via chairman@ctfcsa.co.uk. This week we meet official translator to the Torres family and Alliance coach regular Nikki DaSilva! 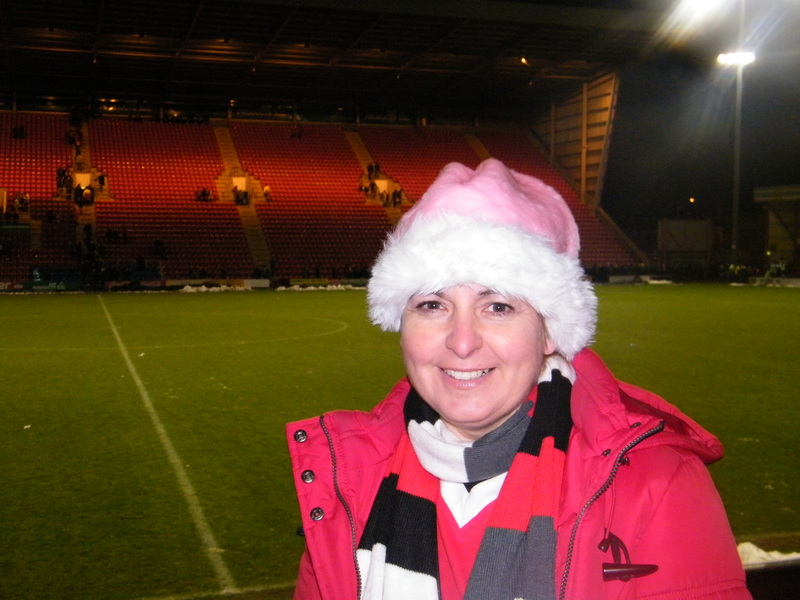 Gresty Road- Nikki borrows Travel Ken's Santa hat! For football fans up and down the land festive soccer has long been a tradition and an exciting part of the season. Four league matches are packed into 15 days leading to an intoxicating mix of Christmas celebration, holidays and football. It has been no different at our club, Crawley Town, where over a hundred people have shared the 4 match experience. 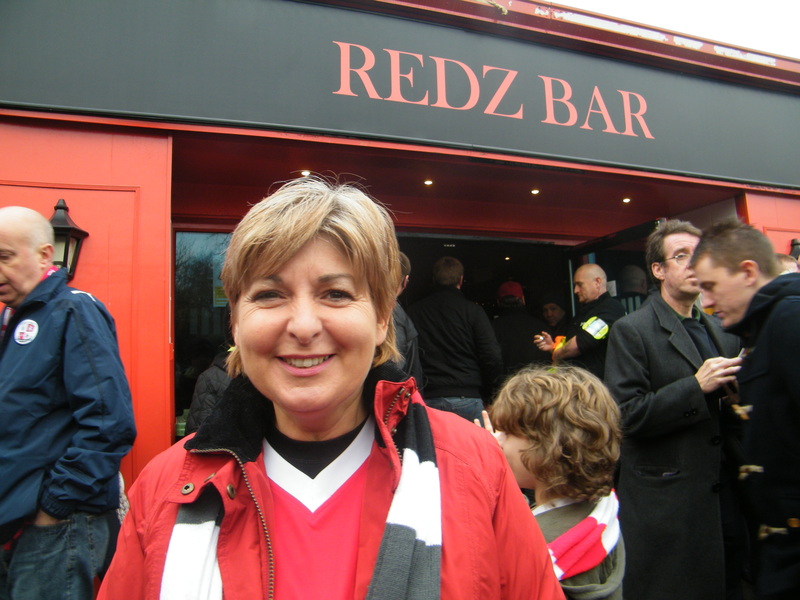 CTSA has been following one of these supporters, West Stand season ticket holder Nikki DaSilva (from Dorking) over the past days to gain a fans eye view. Nikki and partner Stephen are instantly recognisable Town fans especially amongst the growing away support. On Saturday 17th December 177 Reds fans swapped Christmas shopping for football and made their way to snowy Gresty Road, Crewe. During the CTSA coach journey north Nikki said “there is a lot of pressure on these players to continue their great form but they never give up and there is an immense amount of talent in the ranks. I am really looking forward to visiting Crewe today and hopefully it will be the start of a wonderful Christmas”. After heavy snow the Crewe ground staff did well to clear the pitch and allow the match to start. At 90 minutes both teams were locked at 1 all and a point a piece. Nikki’s view on the way home; “I felt we played really well today but couldn’t find the killer goal in the 2nd half. It was a case of 2 points dropped!” Nikki and the rest of the CTSA coach travellers were back in Crawley at 10pm. On Friday 30th December Barnet were next up at the Broadfield. We caught up with Nikki before the game, and she explained, “I have been really looking to this evening’s match, hopefully we can get back to winning ways.” Fans didn’t have to wait that long for the pivotal moment of the match as Tyrone Barnett knocked in a third minute winner. That was the end of the entertainment in a dour, rained soaked evening. She summed up; “it was a scrappy game with lots of mistakes but on effort alone I felt we just about deserved the victory. 3 points is fantastic and it’s the start of an exciting weekend’. Nikki celebrated her birthday on New Years Day, and stayed over in Oxford on the Sunday evening- which made for an easy morning getting ready for the big away match but meant that they unfortunately missed being part of the Alliance coach convoy! 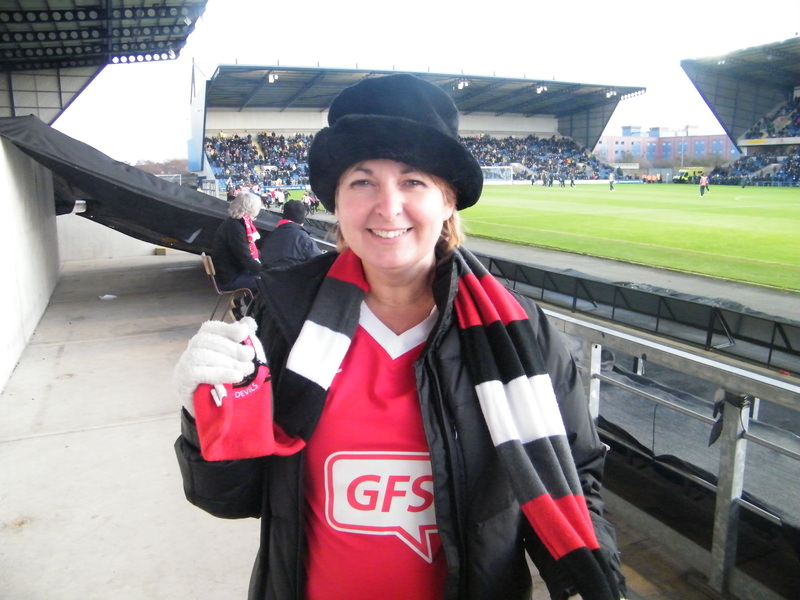 Nikki and Stephen took their place in the North Stand at Kassam stadium with around 620 other Town fans. They were both jumping up and down in wild celebration as Tyrone smashed in an impressive equaliser and the match finished one each. Now, back to the Broadfield for the FA Cup, then westward ho to Bristol and Plymouth!